AI is a major trend in video surveillance with manufacturers paying significant attention to Intel's Movidius Myriad chips. Indeed, Avigilon has announced that their next generation AI H5 cameras will use the Myriad X. But how well do these Myriad X chips perform? IPVM has done its first testing of the Myriad X chip (via the NCS2) and shares results inside this report. Cameras like Avigilon will use Intel / Movidius chips inside them to deep learning / Artificial intelligence. To the side is an image of a Myriad X chip. Video will be sent into to on-board chip, the chip will run deep learning models and it will output categorizations of people, objects, faces, etc. 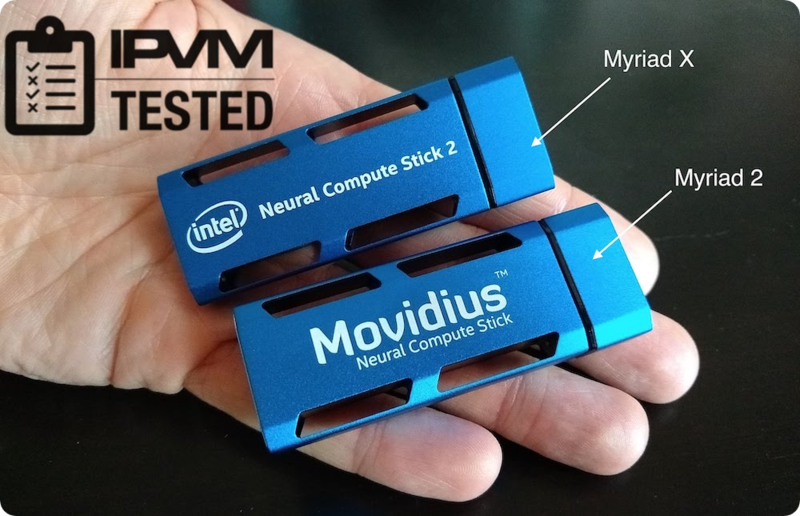 Just a week ago, Intel announced its second generation of 'Neural Compute Sticks' (NCS). 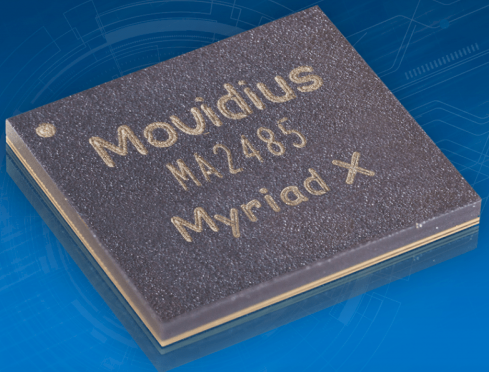 While the first NCS had the original / older Movidius Myriad 2 chip, this new one has the newer Myriad X inside, which Intel claims "delivers 10X the performance compared to previous generations". IPVM bought the NCS2 and tested it. ** ** * ***** ***** ** ***** ************ **** ************* paying *********** ********* *******'* ******** ****** *****. ******,******** *** ********* **** ***** **** ********** ** ** *********** *** *** ****** *. *** *** **** ** ***** ****** * ***** *******? **** *** **** *** ***** ******* ** *** ****** * chip (*** *** ****) *** ****** ******* ****** **** ******. ******* **** ******** **** *** ***** / ******** ***** ****** them ** **** ******** / ********** ************. ** *** **** is ** ***** ** * ****** * ****. ***** **** be **** **** ** **-***** ****, *** **** **** *** deep ******** ****** *** ** **** ****** *************** ** ******, objects, *****, ***. **** * **** ***,***** ************ ****** ********** ** '****** ******* ******' (***). ***** *** ***** *** *** *** ******** / older ******** ****** * ****, **** *** *** *** *** newer****** *******, ***** ***** ****** "******** *** *** *********** ******** ** previous ***********". **** ****** *** **** *** ****** **. Myriad * ~= *. ** ****** * ***: The NCS2 ran roughly 2.7x frames-per-second more than the NCS1 in their face detection model we tested. Intel says that different optimizations and measurement changes would increase this significantly (discussed in caveats below). Faster **** *** (**): The NCS2 / Myriad X outperformed the i7-7700K (a top-of-the-line in 2017) chip tested here, a significant advance given the Myriad X being significantly lower cost and lower power consumption.  Little/no ******** ****: Our tests noted no differences in output video accuracy in line's feedback that OpenVINO's model-optimization step should be considered "lossless." 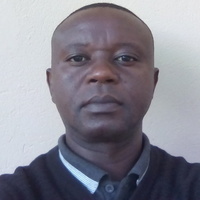 They pointed out that allowing lossy model compression (when converting a model to be run on Myriad; eg FP32->FP16 data-type downsizing) would cause issues with vendors training a model with certain expectations, and having a different (lossy) model for inferring. Model ************* ** ******: While Intel has mentioned YOLO support for OpenVino, the current YOLOv3 is not yet compatible on Myriad chips due to a particular network layer. ***** **************** ***** *** ******* ********** ****** ** ** *** ** CPU, *** ****** ** *** *** ********** ** ****** ******* due ** * ********** ******* *****. **** ** & **: ***** ******* ***** *** ** *** on ******, *** *** ***** *******. **********+***: *** ***** ** **** ****** **** *******, ************ ***** face-detection-retail-0004 (********** ***** **** * ******-**** ********). *********+***: *** ***** *******. 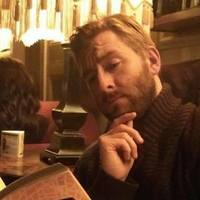 ** **** ******* ****** ****** **** Github ** *****'* *** ******. ***********, *****'* *** ******* *** **** ****** **** *** ***, for **** *******. **, *****'* ****-*********-******-**** ***** ******* *** *** on ***, **. * ** ******* (**** ***** ******** ********** ******* numbers ** **** ******). * *** ****** ** *** ***** ***** ******* ***: (*) We *** ******, **** ******* **** ***** *++ ****; (*) our ***-******* ******** ******* **** (** ****** *******/******* ******), *** isolating ***** ****; (*) ** *** *** ***** ******* ************ handling ** ***** ***** *******, ***** ** ***** **** ********. Questions / ******** / **** ** **** ****? ** **** ******* ******* ** *** **** / ****** * along **** ***** ********* *** **** **** ****** **** *** next *** *****. **** ***** *** **** ** *** ******? *'* **** ** ********** **** **** ** * *** ****. Do *** "****" **** ***** **** * ******** *** *** a ******* *** *** ****** ** ***** *********** *******? *** these ******** **** ****** ** ******** *** *********? *** **** ****** ** **** * *** **** **** *** other *** ******. ** * **********, ***** ****** ******* ****** aren't ****** *** ********** ************, *** *** **********/******* **** ****** network / ******* ** *** ****** **** (** *** *** it ********, ****** *** **********, ***). ***'** ** ***** ** integrated ****** **** ** *** **** *****. **** **** ** *** *** **** ** *** **** ***** (I'll *** ***** ******* ** ****-****** ******* ** **), *** it's **** **** **** *** ***. ***'** ** ****** ****** cloning ********'* *** ****** *++ *****. *** *** **** ***** (after *** ******* ********) ** ~/*****/*******************/****************/****************/*******. ** ** "*** **** open ****** / ********", ** ******** ***** ** "***" - they **** ** *** *** *******. *** ***'** **** ** read *** ******** ******* (**** ** *******) ** ~/*****/*******************/*********. ******* ********, *** ** ******* $ ** $$ ** $$$? ****** **** **** **** **** **-*****. * ******* *** * days *** *** ** ** ******** ******. **** ******** - **** ***% *** *********** ** *** **-***** mean **** **** ********* *** ***** *** ***** **** **** of ** ** ** ** ******** ******* **** ***** ******? ****, *** *** *** *** **** *** ****** *******? ** there * *********** ****** ** ******* ** *** *****? **** wondering **** *** ****** **** ** ** *** ******* *******/****. *** **** * ** ***, *** *'* ************* ******. * think **'* ** *** ******, ** ********* ***% **** *********** of * **** *** ** **'* * ***** (** ********** aggregate ****** ****). ** ************ *'* ******** ** **** *. **/* cores *****. * ***** *** ***** *** *** **** **, ** ********** heat. *'** *** ** ***** ** * ****** *** ** gauging. **** ***** ** * * *** *****, *********** ******* of ****** * **** (** ***** ****** **** *****) ******** to **** ****** ****. * ***** **'* ** *** ******, ** ********* ***% **** utilization ** * **** *** ** **'* * ***** (** comparable ********* ****** ****). ** **** ** ****** *** ****, * ***** ******* **** the ****** **** ** ** ********** ****** ********, *.*. ***%=**%. ****** **** ******** *** ***%, ***** *** * *** ** cores? ** ** **** ***** ******** **** **** *? * *****’* **** **** ** **** *** *******/******* **** *** mobile ********** **** ********** ** *****. ***** ***** ** ******* everything **** ***. * ******* **** *** *** * **** but ******** **** ******* ***** ** ******* ***********. ***, ** *** ***** ** ** *** / ************ ******** on ** / **** ******** ** *** **** ****** ** well. ** *** **** ******* ** ** ********* ***, ********** **, some *** *** **** **** ***** / ******** ********* ****. Upcoming ********* **** ******* ****. ****** ************ ******** **** **** ** ********** *** ******* ******. * ****** * **** ** ***** ** **** **** **** mouser ** *** ****** ****** ************ *** *** **** ** play **** **** **** *** *******. ** ******* * *** openVino **** *** ***** *** *** ** **** *** ********* the ***** ** ***(*** ******). ******* ** ********** ** *** it ****** *** *** ** **** ** ******. * ** ************* ** *++, **** ******* *******, *** *** samples **** ****** ****. * **** **** ******** *** ******* *** ******* **** ** the ******* **** ** *** **** *********** ** ****. ** is **** ** ********** *** *** *** ****** **** **** other *** *** ****** **** *** ** ***********. *** *** license ***** ***** *** ****** ** ********* **** ** *** into *** ******* ***** ********* ***** ** *** **** *** license ***** ***********. **** **** * *********** ******* ********* *** recognition. ** ***, ****** ************ **** ***********, *** ** ** ****** early ** **** ***** ***.